Snowflakes fall, dusting rooftops and cobblestone streets with a layer of pure white. Candles and strings of lights illuminate cafe windows, inviting passersby in for a hot mulled wine. Winter is an enchanting time in Estonia with dozens of festive, seasonal attractions. 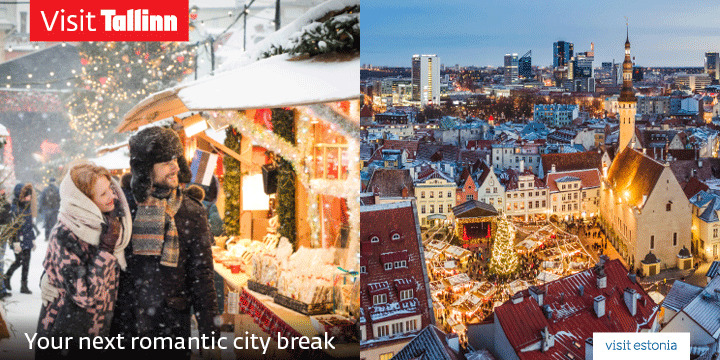 A Christmas in Tallinn will be an unforgettable memory to treasure for years to come. 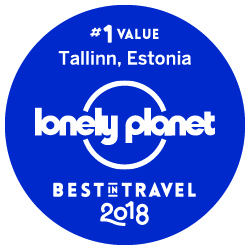 Tallinn has been named the number one best value destination in the world to visit in 2018 in Lonely Planet's Best in Travel, the highly anticipated announcement of the world's hottest destinations that should feature on every traveller's wishlist for the year ahead. The snowy landscape outside will be frosty, so snuggle up with your loved ones in a unique hotel with first-class comfort and charm. The medieval Old Town is the ideal place to stay during a wintertime trip to Tallinn, on winding streets of historical buildings, a stone's throw away from the Tallinn Christmas Market. The weather during Estonian winters ranges from mild to subzero, so pack appropriate clothing to keep you toasty. The Savoy Boutique Hotel, consistently voted one of Estonia's best, is small and luxurious, decorated in Art Deco style. Hotel Telegraaf began it's life as a post office and telephone centre in 1878, but has since been renovated into a modern 5 star establishment. Guests at My City Hotel can enjoy a large collection of Italian art that decorates the walls as well as fresh baked breakfasts and an in-house spa, all without leaving the Old Town. For elegant yet budget-friendly accommodation, look just outside the Old Town. For a taste of "manor elegance right in the heart of Tallinn", book a room at the Von Stackelberg Hotel, a 19th century city estate of German-Baltic Baron von Stackelberg. Each of the rooms at the modern Solo Sokos Hotel Estoria, in the city centre, are different and tell an individual story. The Park Inn by Radisson Central Tallinn, just across the street, is around the corner from the lively Rotermanni quarter. Tallinn is compact and easy to navigate, but it still has distinct neighbourhoods, each with it's own flair and energy. In addition to old favourites, check out the city's hot new cafes and restaurants. Restaurant Korsten, Armas & Hea Toit is located in the Kultuurikatel, also known as Tallinn Creative Hub, a centre for cultural events and activities situated in a retired power plant. A visit to Restaurant Fabrik, with a cosy Nordic interior and menu, or to Apelsini Raudtee, a converted former railway building, will take you to the lively and down-to-earth Kalamaja district. After a stroll in the snow covered gardens of Kadriorg park and palace, sit down for a meal at Restaurant Mon Repos, housed in a villa. Attend a weekly bread baking workshop and other hands-on activities at the Estonian Open Air Museum. Take a break from the snowy weather outside to explore contemporary and traditional facets of Estonian culture. Learn about rural life at the Estonian Open Air Museum with a special winter program including a Christmas Village and Holiday Weeks with handicrafts, bread baking, wood chopping and more. The Town Hall Pharmacy, found on the same square as the Christmas Market, is the oldest continually operating pharmacy in one premise in Europe, dating to 1422. You can take a look at the old rooms for free or participate in a medicinal workshop. Estonia is a seafaring nation in all seasons and The Seaplane Harbour Museum tells this story through interactive exhibits: icebreaking ships, submarines, cannons and even ice boats. The design of Kumu, the Art Museum of Estonia, is an impressive modern artwork itself and was awarded the European Museum of the Year in 2008. Check out the permanent Estonian collection or any of the Christmastime concerts and performances. The most important Christmas tree in Estonia stands at the centre of the market each year. The world famous Tallinn Christmas Market is an absolute must-see during a holiday visit, spreading out in the Town Hall Square around a towering, glowing Christmas tree. Santa and his reindeer greet children and handmade goods and refreshments can be bought from small huts. Gingerbread Mania is a quirky event showcasing the art and sculptures of hundreds of designers made exclusively from gingerbread cookies. Christmas Jazz is a multi week collection of concerts by international artists in intimate venues across Tallinn. Read more about Christmas in Tallinn.